Add lukewarm water, fresh yeast, and sourdough starter to a large bowl and whisk until the yeast is dissolved. Add bread flour, whole-wheat spelt flour, and salt. Stir with a spatula until it becomes a smooth dough. Let rest at 25°C/75°F for approx. 40 – 45 min. Transfer dough to a floured surface and carefully knead the dough with your hands. Transfer to a cast iron pot and let rise at 25°C/75°F for approx. 30 – 40 min. or until doubled in volume. Preheat oven to 250°C/480°F. Place a deep baking sheet into the lower level of the oven and fill it with some water. Then, place an oven rack on the level above. 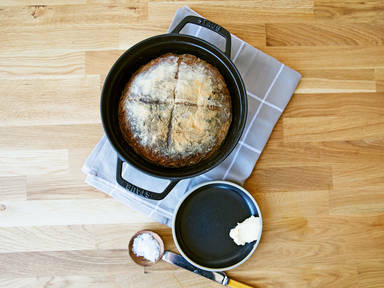 Cut a cross into the top of bread dough and transfer the whole cast iron pot to the oven. Bake the bread in the cast iron pot for approx. 35 – 45 min., remembering to open the oven door halfway through the cooking time to release any steam and closing again afterwards. Remove bread from the oven and let cool down completely before slicing. Enjoy!